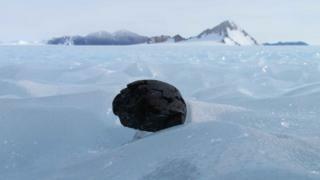 The go-ahead has been given for the first British expedition to collect meteorites in Antarctica. Most of the space rocks now in collections worldwide have been picked up on the continent. The region's great expanse of ice makes searching for the blackened remains of objects that have fallen from the sky a particularly productive exercise. But the UK venture will target a strangely underrepresented class of meteorites – those made of iron. These are the smashed up innards of bodies that almost became planets at the start of the Solar System. Finding more of them could give us important clues to events that occurred some 4.6 billion years ago, said Dr Katherine Joy from Manchester University. "We can't access the iron core of the Earth, but iron meteorites provide us with a really nice guide to what the inside of our own planet is like and gives us an indication of how many planets there may have been in the early Solar System," she told BBC News. Media captionDr Geoff Evatt: "We think we can explain this drastic under-representation"
Ten times fewer of these iron lumps are recovered on the White Continent compared with other parts of the globe. The British scientists think they know the reason for this discrepancy. They have developed a mathematical model that suggests the chunks of metal are all still out there, waiting to be picked up; they just happen to be buried a few centimetres below the surface. Technologies normally employed in landmine detection are being adapted to make a wide sensor. This apparatus will be dragged by skidoos across the ice to find the hidden space material. A prototype system should be ready for testing at the UK's Halley research station in the Antarctic summer season of 2018/19. Assuming this goes well, a team will then deploy to a deep-field site a year later to begin the iron hunt in earnest. The Manchester-led project is funded by the Leverhulme Trust with logistic support from the British Antarctic Survey (BAS). Any meteorites that are located will be brought back to the UK to be curated and studied. It is hoped the search will prove so successful that expeditions will become an annual event. 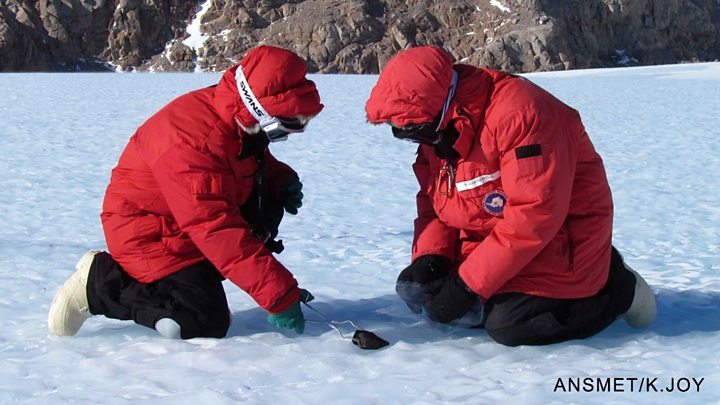 Image caption Meteorite hunters concentrate their searches in "stranding zones"
Of the more-than-35,000 meteorites catalogued in collections, something like two-thirds have been retrieved from the White Continent. Not only does the colour contrast make for easier prospecting, but hunters also get a helping hand from the way the ice sheet moves. Meteorites that crash in Antarctica's high interior are buried and transported towards the coast, ultimately to be dumped in the ocean. But if this conveyor happens to run into a barrier on the way - such as a range of mountains - the ice will be forced upwards and scoured by winds to reveal its cargo. Meteorite hunters on the continent concentrate their searches in these special "stranding zones". What they notice, however, is that a mere 0.5% of discoveries are iron meteorites. Based on global statistics, this number should be more like 5.5%. Dr Geoff Evatt is a mathematician specialising in glacial systems. 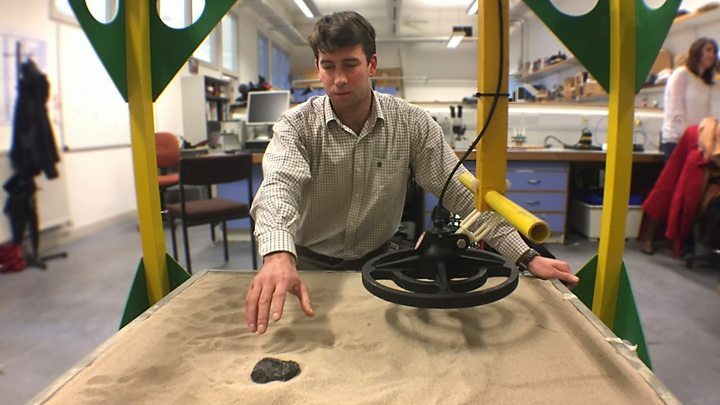 His work suggests the properties of iron-rich meteorites mean they struggle to break the surface at stranding zones in the same way as stony meteorites. "As they get nearer to the surface, the iron meteorites see the sun and absorb heat energy, and that allows them to melt back down," he explained. "Iron has high thermal conductivity; it transfers heat from its top side to its underside where it can melt the ice below and essentially sink back down. "That doesn't happen with the stony-type meteorites because although they absorb the energy, they can't transfer it as efficiently to their undersides. "We think there must be a great mass of missing iron meteorites just under 30cm below the surface." If the team's apparatus can identify the right places, it should be fairly straightforward to dig out the meteorites. Prof Tony Peyton works in Manchester's School of Electrical and Electronic Engineering. He is looking to incorporate fairly standard landmine detectors into a 10m-wide rig that can be pulled across the ice to sense the sunken treasure. "The issue is not so much signal to noise that we would have in our more extreme and demanding applications; the issue for us is really the ergonomics and practicality of engineering a system that can cover the area that we want and also cope with the environmental factors - the temperature range and the vibration." Media captionDr Katherine Joy: "There is a natural meteorite conveyor belt system"
The team has yet to make the decision on where precisely to conduct its search. Logistics demand it be within range of Halley and the expertise of BAS. This means the chosen site is likely to be somewhere along the Shackleton, Argentina or Pensacola ranges. These territories have largely been ignored by meteorite hunters to date. But from satellite images, it is clear they have extensive areas of dense, blue ice - the kind of ice that has been forced upwards and brushed clean of snow by Antarctica's relentless winds. Dr Joy plans a reconnaissance to the region in the same season that the detection rig is put through its paces at Halley. "Nasa has just announced the Psyche space mission which will visit an iron asteroid. That's going to a body made of exactly the type of material we hope to be collecting in Antarctica," she said. "Understanding the differences and similarities between what Psyche samples in-situ and what we see in meteorites in Antarctica is going to be critical to unlocking some of the secrets of the earliest days of the Solar System."